July 4th tops for beer sales; North Dakota #1 for year. What's the top beer holiday in the U.S.? According to Nielsen —a consumer information and measurement company— it's the 4th of July ... or maybe not. In 2012, U.S. beer sales for the Independence Day holiday period were $1.36 billion, the most of any food category the company measures. Nielsen determines the metric based on sales not solely for that day but over a period of about two weeks before and after. But, pick your stat. 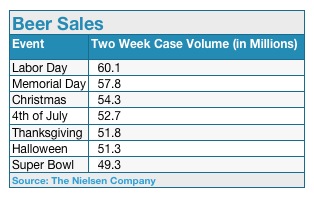 The year before, Nielsen had ranked Labor Day —in terms of CASES of beer sold— at number one, with Independence Day as only the fourth highest. The Super Bowl, by the way? It came in at the seventh spot. According to the Brewers Association —a trade association for U.S. 'craft' breweries with annual output of 6 million barrels of beer or fewer— the United States is now home to over 2,500 breweries. 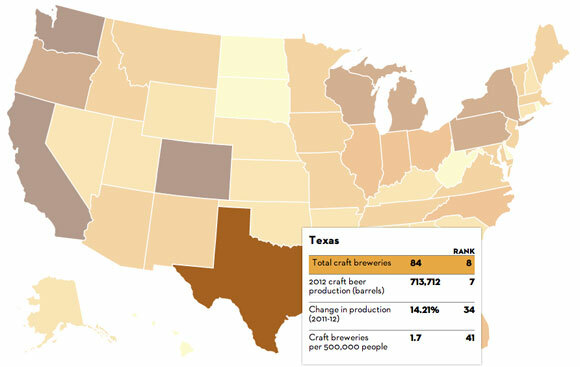 The New Yorker Magazine has posted an interactive map on-line showing state-by-state the total number of 'craft' breweries, each state's annual beer production, production growth (2012 vs. 2011), and breweries per 500,000 people, and, then nationwide in the U.S.: the fifty largest 'craft' breweries, the fastest growing breweries, and those breweries which opened in 2012. The Beer Institute —a trade association for larger breweries and beer wholesalers in the U.S.— has released figures for 2012 that show that total U.S. beer consumption —'craft' and macro— rose, for the first time in several years, by 1.5 percent in 2012. The Beer Institute credits that to an improving economy and above normal winter and spring temperatures. By contrast, the Brewers Association reports that 'craft' beer, in 2012, grew 15% by volume and 17% by dollars, accounting for 6.5% of the total U.S. beer market. The Beer Institute also reported on the amount of beer purchased and consumed state-by-state in 2012. ... North Dakota, whose citizens consumed 45.8 gallons of beer per person during the year. That's the equivalent of 488.5 12-ounce bottles of beer. WHO'S THE THIRSTIEST IN THE DMV? Maryland, with a population of 3.2 million, was 25th in total national consumption at 99.7 million gallons, but only 47th per capita at 23.2 gallons (247 bottles) of beer. Virginia, with a population 5.1 million, was 11th in the nation with 159.4 million gallons of beer consumed in 2012, and 37th in per capita consumption, at 26.7 gallons (284 bottles). Thirsty Washington, D.C., with a population of 445,508, was 50th nationwide in terms of total beer consumption, at 13.8 million gallons in 2012, but was tops in the tri-state area in beer per person per year, at 28.3 gallons (that's 301.8 bottles per person), 32nd nationwide. Coming in last, 51st out of 51, for total beer consumed, nationwide, was Wyoming, at 13.7 million gallons total, but 15th per capita, at 33.0 gallons. 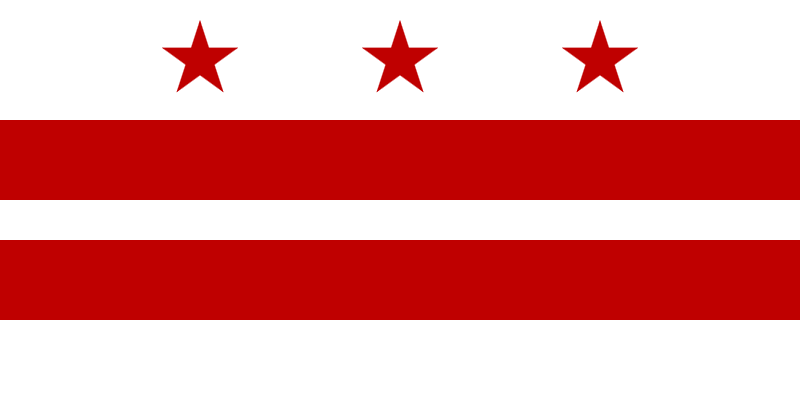 And, the most sober state in the Union? That would be Utah, whose citizens consumed only 20.2 gallons of beer per capita in 2012, the equivalent of 215 bottles of beer per person. That's more for the rest of us. 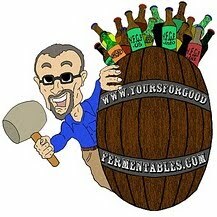 Read more on the state of the beer industry 2012-2013: here. 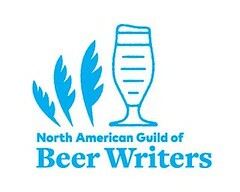 Here's the link for the Beer Institute's pdf.